Russian skicross racer Maria Komissarova has been seriously hurt in training with doctors making an immediate decision to operate, the Russian Freestyle Federation said on Saturday. Komissarova sustained the injury while training at the PSX Olympic skicross venue at Rosa Khutor Extreme Park. There were no immediate details of her injury, but the federation said the 23-year-old would not compete at the ongoing Sochi Games. Russian host news agency Ria Novosti quoted a source close to the situation as saying the injury was a fracture of the spine with a dislocation, that she could not be transported to Moscow, and that an operation would be carried out at Krasnaya Polyana hospital. The 1,200 metre ski cross course at Extreme Park is a medium-pitch slope which features cambered turns, gap jumps, drops and flat sections. The skiers race down the course in groups of four in a test of speed, skill and aggression with the first across the line the winner. "It's big, some big jumps," Slovenia's Filip Flisar said after getting a first look at the course on Friday. "It's cool. I think maybe they have to do some work on some of the landings but it looks good." Komissarova's accident comes two days after a track worker at the February 7-23 Olympics was struck by a bobsleigh, suffering two broken legs. The worker was hit by the "forerunner", which is sent down the track ahead of the official competitors to check for safety. Russian ski jumper Maksim Maksimochkin was taken off the course on a stretcher on Wednesday night after crashing during practice on the large hill. He spent the night in hospital and was diagnosed with two fractured ribs. In figure skating, Jeremy Abbot slammed into the barriers after falling on his opening jump. He lay grimacing in pain for almost a minute but then finished his programme. 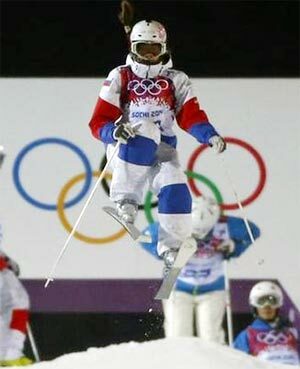 Komissarova's crash, though, marks the first serious athlete accident of the Sochi Games. Four years ago, a tragic pall hung over the last Winter Olympics in Vancouver when Georgian luger Nodar Kumaritashvili died in a crash during a training run on the day of the opening ceremony. Sochi Olympics: It is 2 am; do you know where the ski jumpers are? Sochi Recap: Truly great Winter Games so far? Sochi Olympics: Take a look at how thirty-somethings dominate!